You're IT AnJu Breathing Space! Three questions with Justa Bucyte, co-owner of AnJu Breathing Space. My business partner and I started AnJu Breathing Space to bring Halotherapy to our local community. AnJu is designed in one goal in mind: to help you feel, look, and breathe better. Upon entering AnJu, you will find yourself in an environment for improvement. Salt therapy has incredible benefits, physically and mentally, to improve the body and we felt that we must share our findings about salt therapy with our friends and neighbors here in Fairfield County. We also felt that there are not many places, locally, where a person can go and spend time with their loved ones or catch up with a friend face to face, just sitting and talking, short of a coffee place or a bar. At AnJu, you can do that in a safe, calm, and relaxing environment, all while receiving the benefits of salt therapy. Finish this sentence in regard to your business. "I wish I could..."
I wish I could educate the local community about the incredible benefits of dry-salt therapy. Whenever I mention Halotherapy/salt therapy very few people know what it is and how to get its benefits. 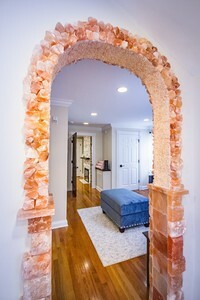 Dry salt therapy has been shown to help alleviate and improve many health conditions such as asthma, seasonal allergies, migraines, acne, eczema, psoriasis, it improves the immune system, is naturally antibacterial and anti-inflammatory. Dry-salt therapy is 100% natural and has virtually no adverse effects. And all that is required from a participant is his or her presence; the benefits are gained simply by regular and natural breathing. Besides all the physical benefits of salt therapy, regular treatments can improve one's anxiety, depression, sleep, and mood. It does not need to be a treatment for a condition, it can just as well be used for relaxation. We have 25 minute and 45-minute sessions. Our best selling service is our 45 minute Salt Therapy Session. Our clients like that the session can be customized to his or her needs. Some clients do self-guided yoga and meditation during the session, some have business conferences, and some just relax in our zero-gravity chairs while listening to relaxing music. AnJu Breathing Space is located at 682 Boston Post Rd. Floor 1 in Darien. Call 203-814-1712 or go online here.